This post is the culmination of a month-long chronicling of the major brain computation insights of all time. Some important insights were certainly left out, so feel free to add comments with your favorites. Below you will find all 26 insights listed with links to their entries. At the end is the summary of the insights in two (lengthy) sentences. Implication: The mind, largely governed by reward-seeking behavior on a continuum between controlled and automatic processing, is implemented in an electro-chemical organ with distributed and modular function consisting of excitatory and inhibitory neurons communicating via ion-induced action potentials over convergent and divergent synaptic connections altered by timing-dependent correlated activity often driven by expectation errors. 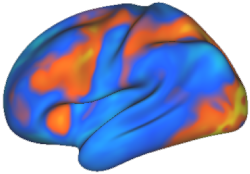 The cortex, a part of that organ organized via local competition and composed of functional column units whose spatial dedication determines representational resolution, is composed of many specialized regions forming specialized and/or overlapping distributed networks involved in perception (e.g., touch: parietal, vision: occipital), action (e.g., frontal), and memory (e.g., short-term: prefrontal, long-term: temporal), which depend on inter-regional connectivity for functional integration, population vector summation for representational specificity, dopamine signals for reinforcement learning, and recurrent connectivity for sequential learning. In #4, it should be Fritsch & Hitzig, not Fitsch & Hitzig. Thanks Mike. The typo has been corrected. According to the SMOG readability calculator, your “Implication” is written on the 30.93th grade level. I guess there is no easy way to explain away 100 billion neurons and a quadrillion synapses. Still, it is nice to see it all in one place as you’ve done. Bravissimo.